A capable robot aeroplane has been successfully catapult launched and recovered using an arrester hook by a US Navy warship - and the ship was only 25 metres long. The USN trials - noted at the Ares blog - took place last week off San Clemente Island on the Californian coast. A Mark V Special Operations Craft operated by famous-yet-secret Navy SEAL frogman-commandoes launched a Boeing Insitu ScanEagle drone using a pneumatic catapult. The UAV was subsequently recovered using the "Skyhook" system, in which the aircraft snags a line hanging from a 50-foot pole. The pocket robot Topgun makes a cat shot. According to the USN, "this is the first time a Scan Eagle... has been launched from this kind of platform". It isn't making a big deal about it, but perhaps it should. The Mark V SOC is a fast waterjet speedboat used for inserting small groups of SEALs in "medium to low threat environments" and for coastal patrol and interdiction work. Vessels of this sort would never normally be able to carry aircraft, except for the smallest hand-launched remote controlled types - or perhaps seaplane robots like the Gull triphibian. 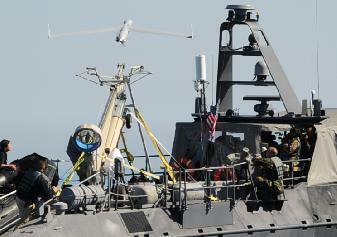 The ScanEagle isn't exactly a combat aircraft, nor even a fully-capable reconnaissance platform. It doesn't have any moving-target-indicator radar, for instance. However, it is significantly more capable than hand-launched jobs. It can stay airborne for more than 15 hours, and carries a stabilised infrared camera. The little craft has a modular avionics bay which can receive different payloads, too. Some months back, Boeing put together a demo in which several ScanEagles performed complex tasks almost autonomously. They were able to follow vehicles on the ground without input from human controllers, and survey designated areas for items of interest without further instruction. A single human operator is supposed to be able to handle up to six of the little planes with ease. The ScanEagles in that demo could even be tasked onto a target by sending an email from a cellphone; and then send aerial video back to the cellphone, so as to confirm they were now tracking the right vehicle. The USN has a separate, much bigger programme intended to produce a true robot carrier jet able to catapult launch and make arrested deck landings on a full-size aircraft carrier. That plane will be interesting - more capable perhaps than the manned jets it will replace. US frigates and destroyers, too, may soon get small droid helicopters. But in both cases the big warships will be replacing an existing capability with something fairly similar - and with something big and expensive which needs a huge, scarce, expensive ship to operate from. But if all you really want is aerial recce, comms relay, and surveillance, you might go with something a bit less unwieldy, a bit less obtrusive. You might choose to have it controlled largely from a portable gadget in the tac-vest pocket of a SEAL or covert operator ashore, and based on a speedboat or submarine lurking in a nearby estuary. It's stretching a point, perhaps, to say that the first robot catapult launch and arrested deck landing has already happened. But in some ways, especially for the kind of wars the US forces and their allies are fighting right now, the full-size robot carrier jet may quietly have been rendered obsolete last week - before it has even flown.